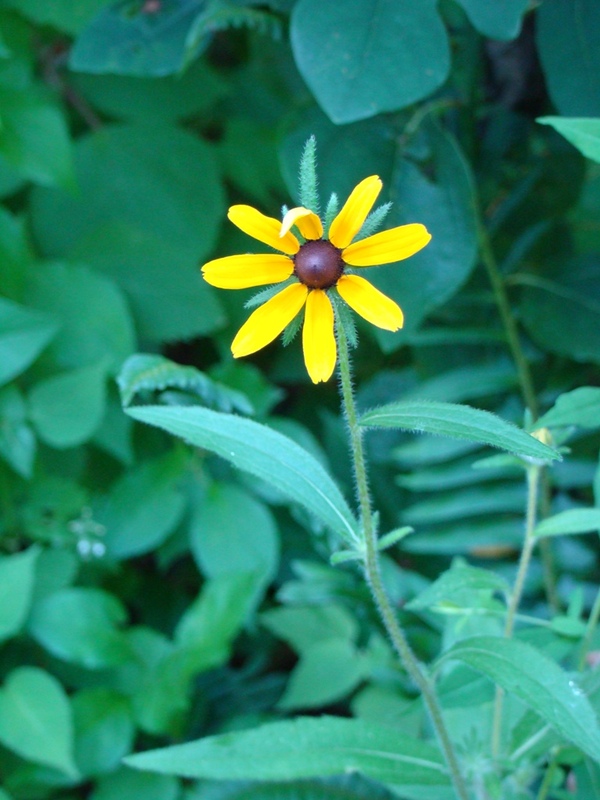 The first of the brown-eyed susans are blooming this week on Roundtop. I liked this one as it looked like it was waving at me with that single bent petal. Hi, back at you, too! The weather is now perfect, a huge improvement over the heat and humidity of just a day ago. It was enough for me to catch-up on some housework—including the long-neglected ironing—last evening. I wasn’t entirely housebound and wandered outside in the woods for a while not long before sunset. I felt as though I’d arrived on a different planet, one that was cool and pleasant, not the tropical un-paradise I’d been stuck in for a week or more. I’m back in the temperate zone! Dog and Baby Dog were both bad last night, no doubt filled with energy after days of doing nothing more active than sprawling across the floor. The raccoons paid a visit to the deck for the first time in a couple of days, too. The blue jays attacked and swooped on the neighbor’s aging, half-blind cat. All is back to normal on the mountain again. 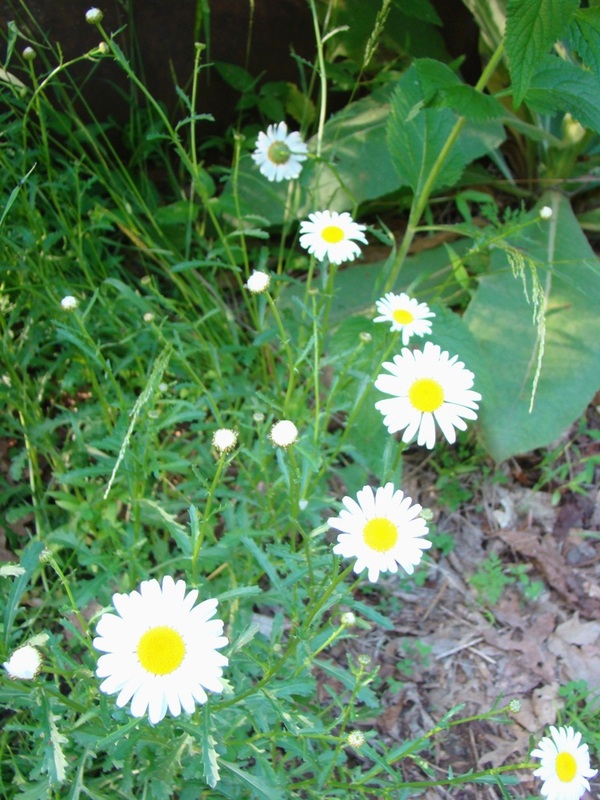 Midsummer flowers are beginning to appear around the cabin. Even though summer is officially just a week old, the August-like heat of the past two weeks is spurring growth. 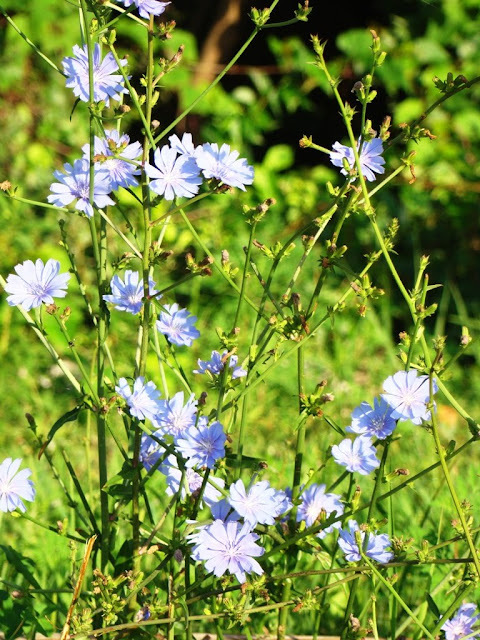 The blue of the chicory flower is suddenly everywhere in evidence. The first brown-eyed susans are starting as well. This early morning I watched two young downy woodpeckers out and about exploring near their nest hole. The white of the young birds looked more grayish than white, and the young males have a bit of muted red on their foreheads. Some books suggest that the young birds are a brighter white than the adults, but I didn’t see evidence of that this morning. Perhaps it’s too soon. When adults, the males end up with a nice red patch on the back of their heads. I didn’t get a storm last night, even though a nice cold front moved across the area. By evening, I could begin to feel the humidity, if not the temperature, starting to lower. Today is cooler and the humidity low, so the weather feels comfortable for the first time in ages. This morning the bedraggled-looking young turkey vulture that roosts on the top of a nearby dead tree was already airborne before 6:15 a.m. When the humidity was high, it stayed on top of that tree, its wings extended for at least an hour longer. Even the turkey vultures like the improved weather! Sometime later today the “August” heatwave that showed up in June will end. It will end in a thunderstorm, perhaps even severe storms, but after days of temperatures in the mid-90’s, I figure the storm probably won’t be any worse than the heat. 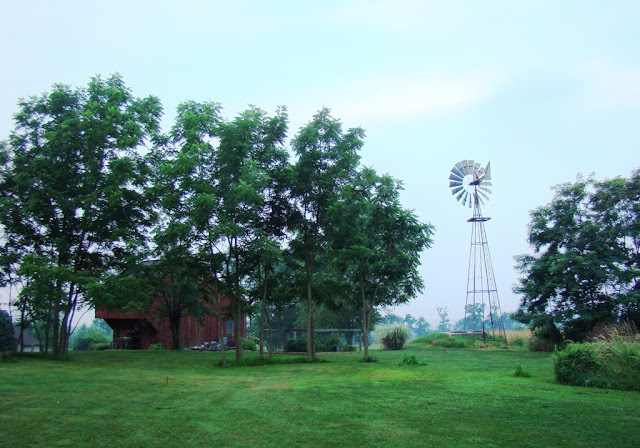 My photo today was taken at my dad’s farm, looking across to the neighboring farm’s windmill. That windmill has been there ever since I can remember, and I suspect it’s about a 70-80 year old windmill. It’s a bit worse for the wear of the years, but still functioning well enough to pump water up from the well. On a humid morning, already hot before the sun is well up, it looks like something from a time long past. Like the animals both at the cabin and at the farm, I try not to do too much during the heat of the day. The temperature begins to moderate around 6 p.m. or so, and that’s when I begin to stir again. And that’s also when I start to see the rabbits, deer with fawn, groundhogs, squirrels, chipmunks and the birds. The birds rush to the feeders, scuffling a bit as bigger or more aggressive species take first crack at the goodies within. Seeing larger birds balancing at a tube feeder is pretty entertaining. The red-bellied woodpecker uses its tail for balance, almost bending in two with its tail bent under and against the bottom of the tube. The towhee is also a tube feeder visitor, holding on to one side and feeding from the opposite side. The blue jay is too tall to feed from the lowest hole, so it stands on its tippy-toes (or tippy-claws) to reach the middle hole. The feeders are soon emptied, though they stood idle all afternoon. The birds are in a rush to fill their bellies before nightfall. I suspect they were just sitting around, not doing much of anything, either, waiting for the heat to dissipate as the sun heads toward the horizon. Yesterday was another day with the kids from adventure camp. A few days ago I lamented that the kids preferred seeing things that were big and splashy and that even a Baltimore oriole wouldn’t be cool unless it was sitting just above their heads and singing. We did one better than the sitting, singing oriole yesterday. A scarlet tanager did just that during the 9 a.m. hike. The only unfortunate part was that the bird wasn’t performing an entire concert, just a few songs. Some of the kids couldn’t see the bird even when they appeared to be looking right at it. But most of them saw and heard it and thought it was pretty cool. Me too. The afternoon hikes were cancelled by a severe thunderstorm, which was better, I think, than hiking in 95 degree heat. At least it was better for me. The morning was very hot and humid by 10 a.m., and it didn’t take me long before I was wondering just how I was going to make it through the afternoon hikes in that heat. Some of the kids were starting to flag after one trip partway down the mountain and then back up again. I had six such rounds to make during the day. During the noon break I went back to the cabin, took a quick, cool shower, drank another quart of water and ate a popsicle, and even though that helped, I wasn’t sure if that was going to help enough for me to get through the afternoon. Then I got lucky. I turned on the TV and saw the radar, a strong and severe thunderstorm was heading right in my direction. At that point, it looked as though the storm would arrive during the 2 p.m. hike. When I got back to camp, the kids for the 1 p.m. hike arrived a bit late and by then I could see the storm would not wait until after 2 p.m. So I took the kids just into the edge of the woods where they managed to find one ripe raspberry apiece and tasted a bit of sassafras. Then I took them back out of the woods and showed them the difference between a storm cloud and a regular cloud. Then we headed for the cover of a sturdy building and waited out the storm. It was a doozy. And it looks as though my luck will hold—the forecast for next week is already promising cooler weather! Isn’t it funny how some things can have a “proper” common name but are known in some places by a different name? 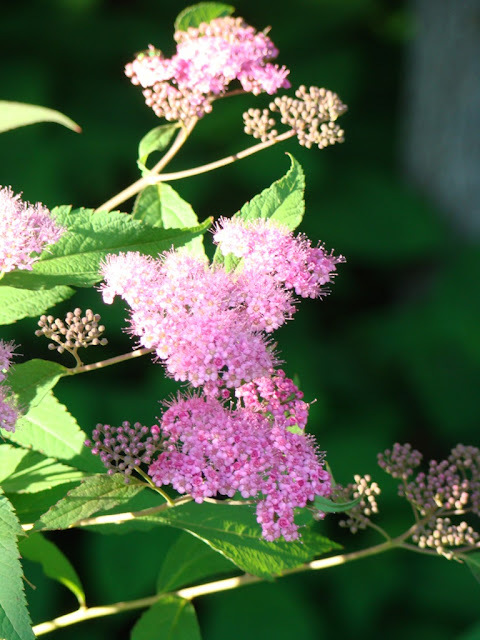 That’s the case locally with this plant, which is properly called ironweed. Everyone in this area calls it butterfly weed or sometimes wild butterfly weed to differentiate it from the kind you can buy in garden centers. I think butterfly weed is the better name—more descriptive. This year is seeming to be odd in other ways, too. I’ve heard more people say they’ve never had so many birds at a summer feeder as they do this year. It’s as though the birds aren’t finding the natural food they should. And the species that show up at the feeders are different than usual too—red-winged blackbirds and grackles. Deer also seem to be behaving in untypically, as well. They are being seen regularly in daylight, almost as much as you’d see at nightfall during the rutting season. It’s not uncommon for deer to exit the woods when the black flies or sweat bees are bad, but this year they aren’t bad. I’m in the woods every day and haven’t been bothered by either of those. 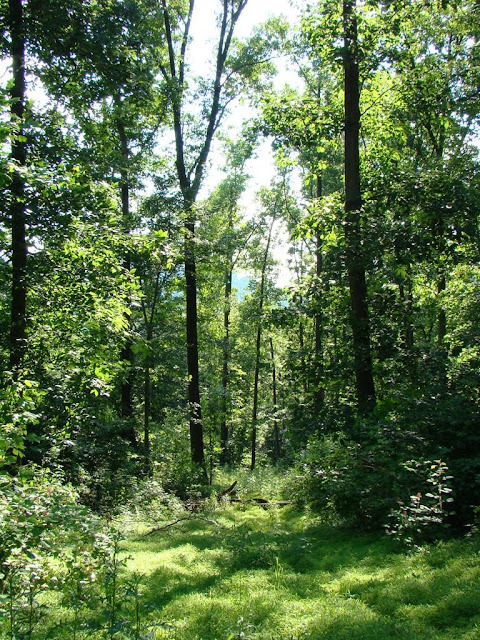 And truthfully, the deer aren’t leaving the woods stamping, shaking their heads and acting as though the flies are bothering them. They are just moving around. The animals do seem to be behaving as though the natural food is lacking, but I can’t say that looks obvious as a reason either. If we were having drought, I’d assume that was the cause. If anything the vegetation is more lush than usual because the woods have seen a lot of rain, which I would have thought would produce more food rather than less of it. So I’m a bit stumped as to what might be going on. For now, the oddities don’t seem extreme or dangerous, just odd. I’ll keep my eyes open and see how it goes. 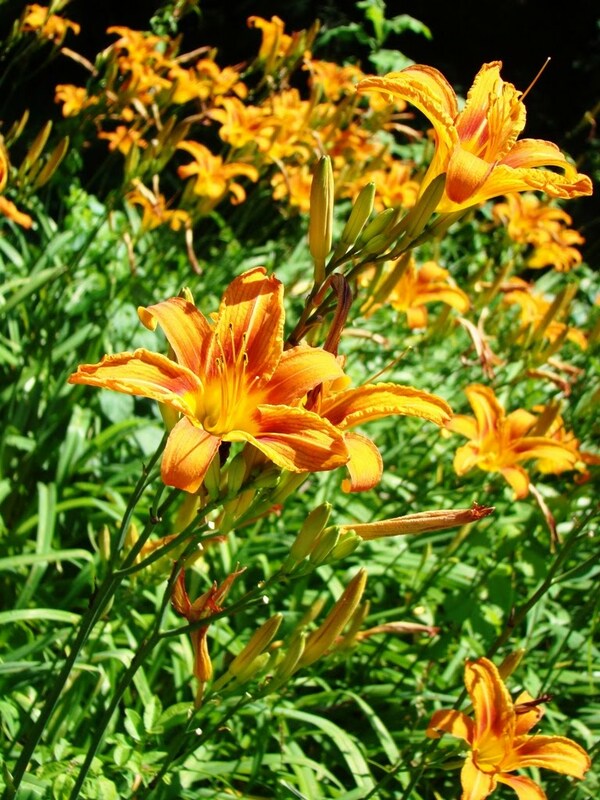 Farmer lilies (as these are called locally) are particularly profuse this year, or so it seems to me. I can’t travel 100 yards down any road without finding a clump of 50-100 bright orange blooms. So many wildflowers are small and delicate. Not so with farmer lilies. Large, robust and spectacular are words better suited for these beauties. I can’t get enough of them! I should also report that my first session of Adventure Camp went well last week. We were hardly properly started down the trail before a small garter snake was caught and held by about a dozen 9-year-olds. When we were done and turned the 10-inch snake loose, it disappeared instantly. I have never seen a snake vanish so completely and so quickly, never to be seen by another group all day. That little thing was getting the heck out of Dodge! 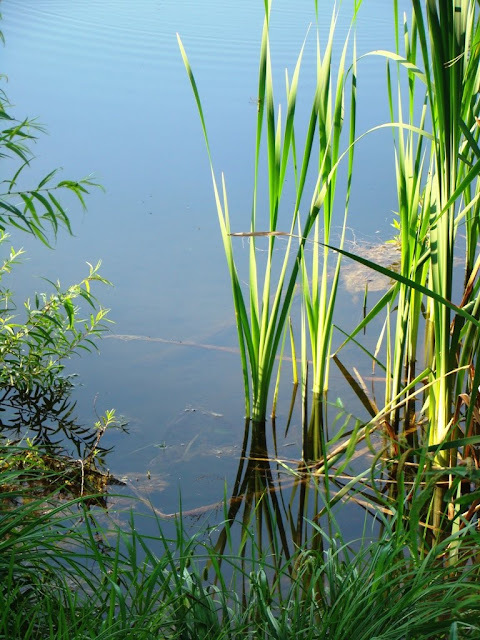 The other groups found toads and frogs, ate the first of the still-ripening black raspberries, tasted sassafras and looked for interesting fungus and ferns. They all seemed to enjoy the walk and the things we found in the woods. That’s pretty much all I have time for on our little treks. I want them to experience the woods and have fun, hoping that is enough to make them want to return to a forest on some other day and explore whatever they see. It’s only a small seed I try to plant, but I hope at least a few of them will take hold and sprout. 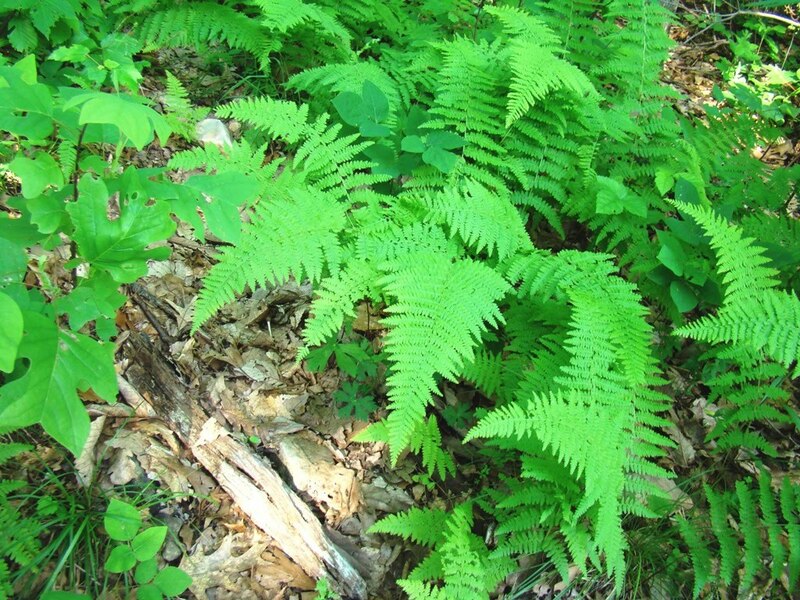 The ferns that make their home on Roundtop mountain appear to love this wet day/dry day weather going on here this month (or is it two months, now?). They are both numerous and lush, covering every bank or wet spot I can find. Tomorrow will be my first day with this year’s crop of kids who attend Adventure Camp. I will take them on a hike into the woods and try to get them interested in the things we find along our way. Kids do better with things that are big and splashy rather than small and subtle. They will do okay with small, if it’s something they can touch. A fox crossing the trail counts as big and splashy. A bug they can hold in their hands is okay. A Baltimore oriole streaking through the forest doesn’t count. It might count if it landed on a low branch in open view and began to sing, but I’m not entirely sure about that. They like eating the wild black raspberries that line the trail we will follow—but they aren’t ripe yet. Last year they liked the “green smoke” that erupted from a puffball when I tapped it with my hiking staff—but they aren’t up yet. Hopefully, we will find enough frogs and toads and other things to please them. Ferns certainly aren’t high on their list, which is unfortunate because we will find so many of them along our trail. I will try and pique their interest to see the differences between the species of them. I will try and explain how observing small differences is how you learn to really look at what’s around you, how those small differences mean a lot. It can be a tough sell. For me, everything in a forest is interesting—every tiny spore that pokes its head above the moss, every tiny plant, the quantity of nuts on a hickory tree this year. For the kids, almost nothing is as interesting as the video game at home. Exploring the outdoors on their own isn’t an idea that ever seems to cross their minds. Or perhaps it’s simply that they have no unscheduled time to themselves to even thing about things like that. We speak a different language, these kids and I, though I work to bridge that wide divide between us. One day, they will inherit this world from us, and I hope they will come to understand and love its infinite pleasures and mysteries. My local area is stuck in an unusual weather pattern—a day of storms, followed by a day of nice weather, followed by storms again. As a result, nothing every truly dries out. Today is the nice day. Tomorrow will be the rainy day again. This is better than all rain, but it means I can’t get to much of the outside work that needs done around the cabin. Soon I will need a machete. Actually, I should probably have one now. I don’t have a machete, so the plants encroach on the cabin, currently preventing a walk around it. The bushes are sneaking their way across my driveway and scrape the sides of the car as I enter. I am tempted, in a fantasy kind of way, to let their long, thin branches close the gap and hide the cabin from view entirely. It would be my secret, a driveway hidden by the forest, so no one else would know one was there. The driveway is not far from that now, and if it weren’t for the nice young woman who drives the FedEx truck and delivers packages to my front door, I might actually do it. No one else even attempts to deliver packages to my front door, and she easily manages the drive up the mountain and into my driveway. The last time FedEx used a substitute driver, he got stuck and one of Roundtop’s tractors had to pull him out. Last evening produced another brief respite from the rainy weather that is May and June this year. A nice breeze earlier in the afternoon helped to dry things off enough that I could venture into the woods without coming back to the cabin soaked to the skin. 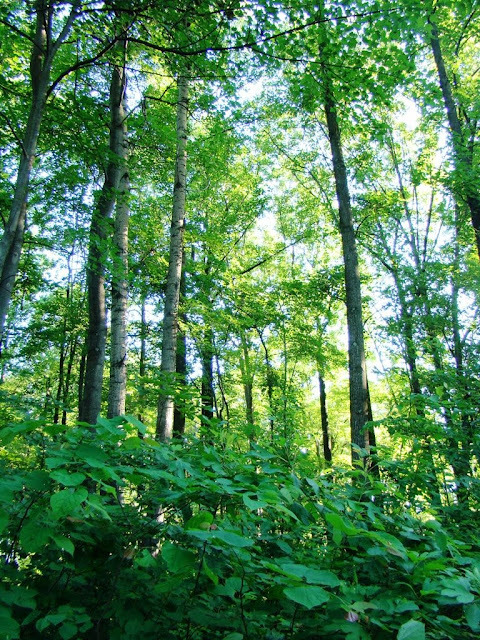 As you can see from today’s photos, the forest is as lush and as dense as a jungle right now. Bushwhacking would require a machete, so I stayed on the trails. Even those were more overgrown than is typical and likely the reason I came home with three ticks. I stayed out of the deepest valley between the mountains, as I knew that would be deep with mud. 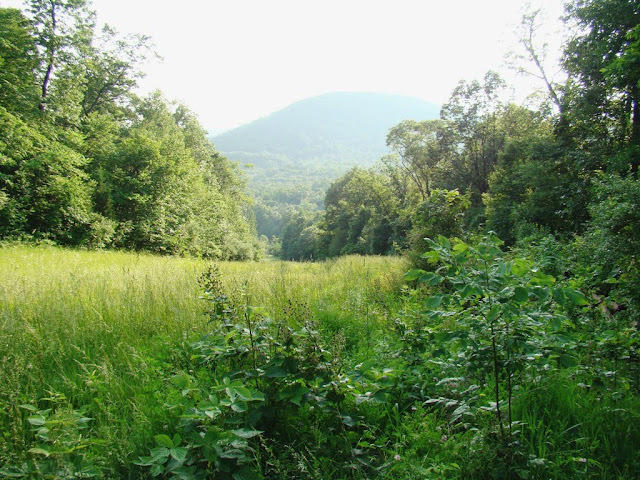 The trail I followed skims along the side of Roundtop mountain about halfway down it. I start out going steeply downhill and am glad I brought a hiking stick. I have to pay attention to where I place my feet and still skid here and there, using the pole to prevent a fall. The trail I wanted heads north and once I reach it, the going is flatter and grassy. The reason I like this trail is because the upslope side of it is covered with moss and ferns. 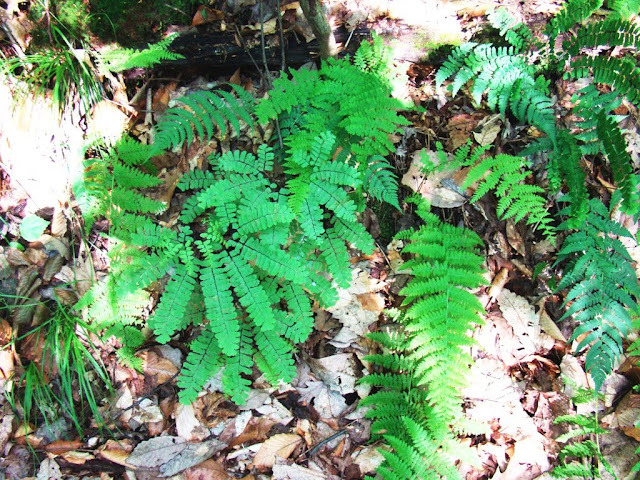 Most are Christmas ferns and lady ferns, but I find one patch of 5-6 maidenhair ferns, the most I’ve ever found in one spot and the first time I’ve located them on this trail. Last year I found one single plant nestled along the edge of a larger, two-track dirt road that somehow survived the summer to appear again this spring. I walked this path many times last year without ever finding a maidenhair fern, so to come across so many on this foray was a thrill. Bird song followed me as I walked—indigo bunting, wood thrush, ovenbirds, Baltimore orioles, mostly. I startled a red fox not far from the edge of the path. The fox skittered away uphill but didn’t go far, crouching to hide not more than 25 feet from where first I saw it. I suspect a den was nearby but I didn’t stop to look for it or further disturb the fox. Like most good walks in the forest, this one was fairly uneventful. The evening was sunny, the path was straight. What more could anyone want? After precisely 1.4 days of good weather, rain and drizzle and lots of fog have returned to the mountain. Is this Seattle? I’m feeling as though it might be lately. The overcast sky makes the lush woods with its dense canopy of leaves look rather dark and gloomy, so my photos this week are taken where no canopy blocks what little light the sky offers. In today’s case, the photo was taken at the neighboring apple orchard. So far, the apples are coming along nicely and some are even starting to turn red. My local area is a good one for orchards in general and apples in particular. 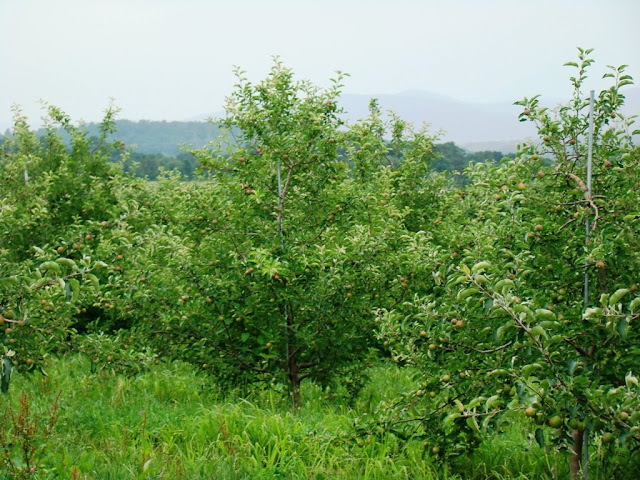 The hills at the base of most of the mountains provide the well-drained soils that suits apples. Adams County, York County’s neighbor to the west, is more well-known for its apple orchards, but the northern portion of York County, where I live, is also good for them. As the orchards meet the edge of the forest, they also provide food for wildlife, though the orchardmen aren’t thrilled with that. Deer routinely munch their way along the edge of the orchard, and wild turkeys are seen much more often in the orchards than I find them (or see signs of them) in the woods. Some orchardmen have carbide cannons, set to go off at regular intervals, to discourage the visits. The wildlife quickly gets used to them, so they don’t work for long. The cannons seem better at discouraging large flocks of roaming grackles or blackbirds. Still, I’m glad the local orchard doesn’t use them, as I’m not sure I could get used to the sound. The early morning light in the forest in late spring and early summer is something I love and look forward to. 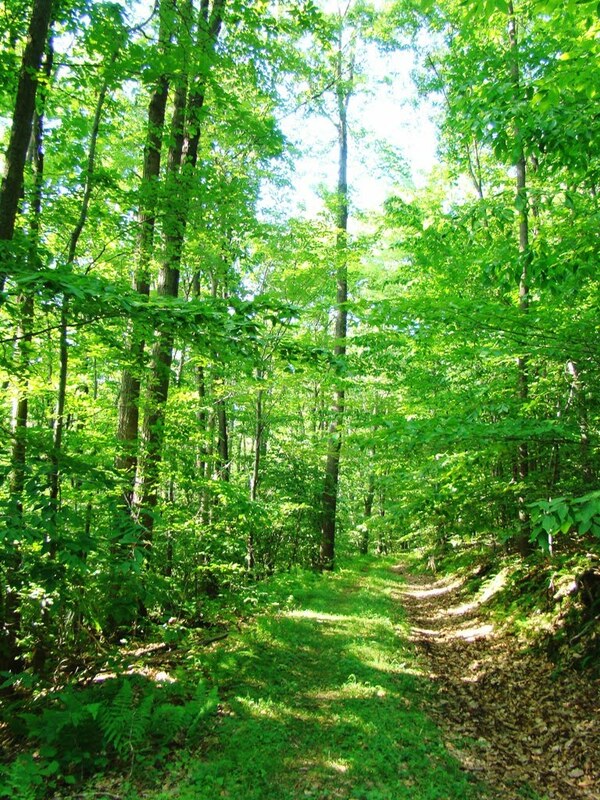 It’s a bright, clear yellow light that illuminates the forest’s bright shade of green. In another few weeks summer’s haze will dull the light’s intensity and, the forest green will dim to an deep emerald green. Until this morning, I hadn’t seen much of this wondrous June light. The sky has been overcast, the light dull and gray for long stretches. 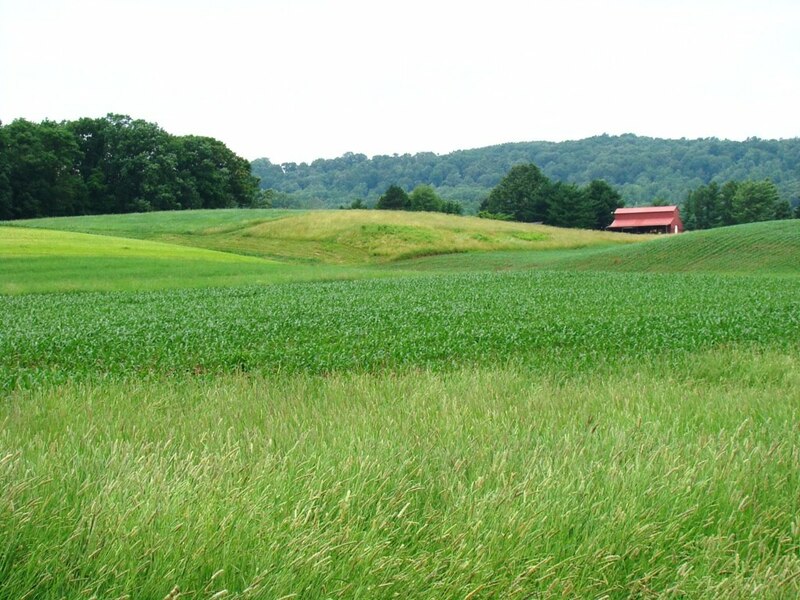 The weather has affected the area’s spring crops. Strawberries this year are good but soft, lacking the very heights of sweetness that would make them great. They are good, though. It’s only when I compare them to perfection that I find this year’s batch missing the mark. Perhaps this change in weather will be enough to push the last of the local berries to a sweeter spot. For the first time in weeks, the forest is drying out a bit, urged by a soft breeze from the northwest. It’s the kind of weather that makes me want to play hooky. I know it won’t last, likely won’t last long enough for the weekend to arrive. But the forest light this morning is enough to lift my spirits and bring a smile to my face. Animals are better than humans at dealing with whatever Grandmother Nature tosses at them. My chickens and dogs were unfazed by the recent earthquake. Straight –line winds that downed trees and tore down signs didn’t faze the squirrel that broke into my bird feeders. I think the one cardinal even sang throughout those winds. Of course, I’ve heard the cardinal singing more or less during a heavy snow, so I’m not sure he should count. I mean, did he really think he’d find his lady love during a snowstorm? That can’t be normal. Still, wild animals are remarkably resilient. They certainly don’t dwell on the “what ifs” the way humans do. They don’t think about how that storm would have affected them if only it had traveled a quarter mile to the west or if that tornado had touched ground instead of staying above it. They simply go on about their business for as long as they can. For the animals in the Gulf of Mexico, life may never be normal again. And they have few options. Breeding grounds are destroyed, and birds still healthy try to return to their young and eggs, even when both are in areas inundated by toxic oil. Extinction for some species is certainly possible—sperm whales, mottled duck, some shorebirds to name a few I know about. Their food sources are gone. The oil slick is huge. All species have a niche on our planet and serve a purpose to help maintain its health. Humans currently don’t understand all the relationships, but the one thing I’m certain of is that they exist. A great blue heron didn’t evolve simply so I could enjoy its beauty. Sunlight triggers sea grass growth, which provides habitat for fish, which attract the great blue heron. We can’t continue to destroy large and small chunks of our planet and its species and expect our own lives to continue in a business as usual mode. That’s the ostrich with its head in the sand. It’s long past time for humans to take our collective heads out of the sand and wake up. Because we are the one species who can think about the “what ifs” of how we fit on this planet amongst all its wonders, it’s time we do so while we still can. It will be for our own sakes, as well as for the lives of all of the creatures with whom we share this planet. I missed the excitement yesterday. An earthquake! My neighbor thought it was a sonic boom or a tree falling by her house. Someone at Roundtop thought it was dynamite going off. The quake was felt but mostly heard up to around 10 miles away. My sister works at a nearby school and thought a truck had run into the building. Someone else thought someone had fallen out of bed upstairs. Up until two years ago, this area didn’t get many earthquakes. In the past two years between 2,000 to 3,000 tremors have been felt. This one was a 3.1 or maybe a 2.9, depending on whose instruments are right. Most of the quakes have been centered just south of Dillsburg, about 5 miles from my cabin. A study about this cluster that was released last year said the quakes were likely caused by “the contrasting strength of igneous and sedimentary rocks” and the fractures caused by the stress between them. The area around Roundtop is mostly igneous rock, such as granite, that was formed by the cooling and hardening of molten rock. Sedimentary rock, such as limestone, is formed by the accumulation of fine rock particles and is predominant a few miles to the north.. The igneous rock is the source of iron ore deposits that were extensively mined locally in the 18th and 19th centuries. The quakes are said to be too deep for the mines to have a direct role, but the study did not rule out a possible correlation. Since the quakes started, the tremors have usually come in clusters and those frequently after rain. We had more of that last night, so it would not be surprising if more quakes are felt in the next few days. The geology people still believes it's unlikely the area will experience a major earthquake. I hope they are right. I’m having a difficult time remembering that this is only the first of June. Already the heat and humidity are at July levels. This area seems to have zipped right by that lovely spring weather with temperatures in the mid-70’s and a lovely breeze pushes cumulus clouds across a clear blue sky. Instead, as you can see by today’s photo, I have that hazy humidity of midsummer. The evening was still a pretty one, if hot. The view behind the cabin is lush with the greenery of summer. The abandoned ski slope looks more like a hay field than anything. 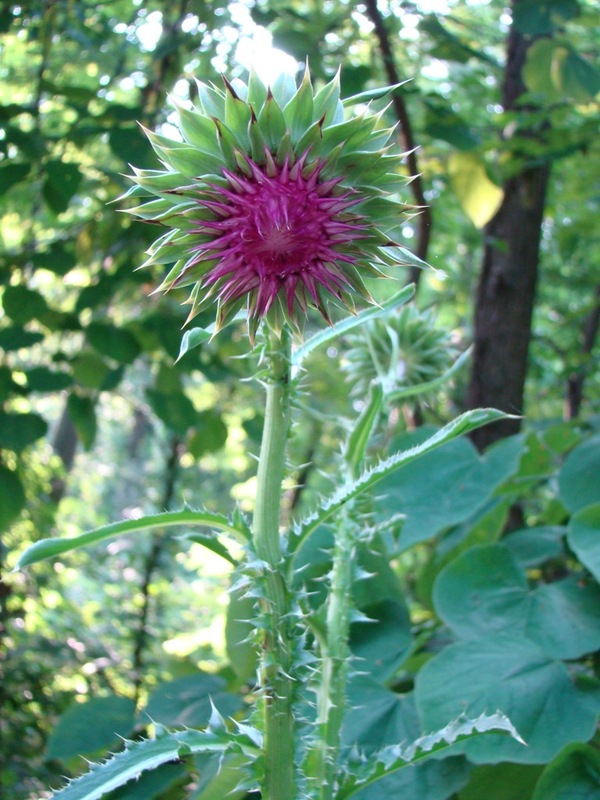 Thistle plants are among those people usually consider weeds. The thorns are impressive, and they grow very tall. This one was already well over 5 feet tall and looks as though it’s capable of taking on all comers. It’s not the kind of thing you want your toddler to fall into. And yet, I suspect that when an Eastern Goldfinch looks at this plant, if they could they would start to drool. To them this is a 5-star restaurant and all you can eat buffet all rolled into one gigantic plant. Most thistles aren’t as large as this one. Seeing this developing thistle flower at eye level, as I did last night, felt a little like meeting a space alien. This is one large thistle plant, and the seeds that will attract goldfinch like bees to flowers should be impressive in both size and number in another month or so. I’m glad this one isn’t growing someplace that I need to get around or by or over. I love seeing the goldfinch, and the goldfinch love the thistle, but that doesn’t mean I have to love every thistle. As long as we want to see goldfinch, we need places where thistle can grow happily without endangering children and pets. Not to mention me. Last evening a real doozy of a storm ripped across Roundtop Mtn. Pea-sized hail, lightning, 2” of rain in about 20 minutes, and just 150 yards or so from the cabin several trees fell and blocked the road for a while. A sign was ripped off its wood frame and pieces scattered up the road. My neighbor said he “heard the freight train” that is the usual indicator of a tornado. But this morning, we didn’t see any signs of twisting, so I’m now thinking it was just a strong burst of straight line winds. In any event, I didn’t have any such wind at the cabin just a few yards away. Even my potted tree remained standing, and it usually blows over in even a moderate wind. Electricity was out for a few minutes, and apparently lightning struck something related to the phones, as they were out somewhat longer. 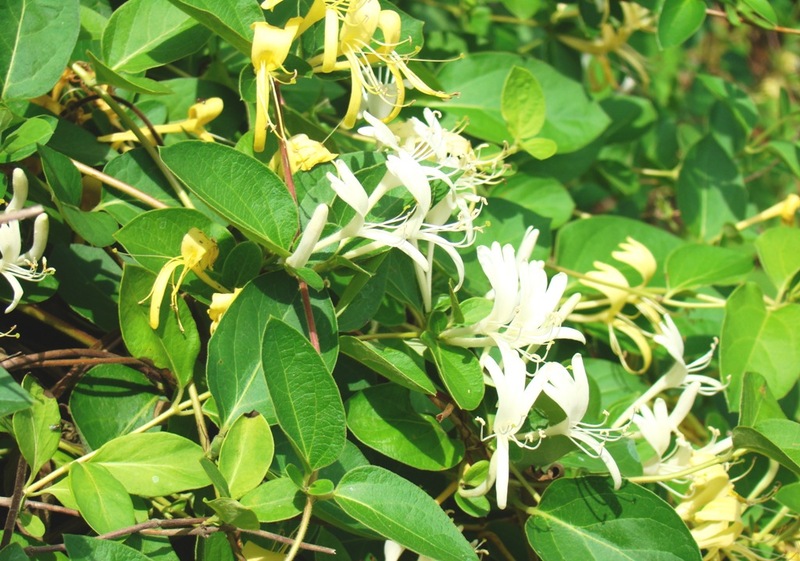 In any event, it was a wild and wooly evening, much belied by this morning’s photo of the blooming wild honeysuckle. Have you ever sucked the honey out of a honeysuckle? It’s a tiny drop of sweet nectar and it’s how the plant got its name. I always show the kids at Adventure Camp how to sip this honey. Most them have never heard of such a thing and think it’s a wondrous trick. 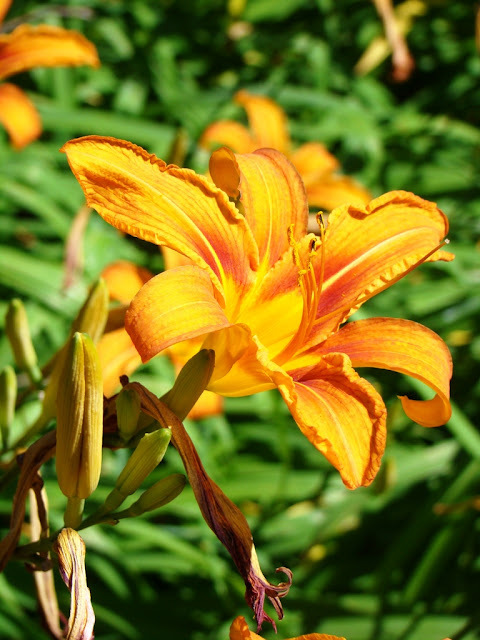 Simply pull the tiny flower off the vine at the base of the flower, and a tiny drop of nectar will appear at the end. The aroma of the flower is enough to make you dizzy with delight, and humans are hardly the only species to find it so. Bees, hummingbirds, butterflies—all flock to the flowers. Sometimes I think nature is all about high drama. Grant opera has nothing on Grandmother Nature. She’s a real diva—raging one moment and then calm and gentle the next. The sweet smell of the honeysuckle follows the angriest storm.